Gibsons BC was originally founded by George Gibson in 1886, George and his two sons had sought shelter from a storm. At the age of 58, George claimed 160 acres, and his sons quickly claimed another 160 acres. George was a well seasoned market gardener and he travelled to Vancouver to sell his produce and return with supplies to build his home by way of a row boat! This little piece of history is truly amazing if you have ever travelled the distance between Vancouver Harbour and Gibsons Landing. It takes about 55 minutes by power boat! and 45 minutes by way of a BC Ferry from Horseshoe Bay ferry terminal which is north of Vancouver Harbour. I could not imagine how George managed to row into and out of Vancouver Harbour! In 1890 the first school opened. There are now technically three elementary schools, Langdale Elementary, Gibsons Elementary and Cedar Grove Elementary as well as one high school, Elphinstone Secondary. The area was very isolated from Vancouver, and a wharf was built close to the site of the wharf today to bring in supplies. Water access was the only option and still is today. The community began to grow and develop around this important portal to Vancouver. The main economic industries at that time were logging, fishing, agriculture & farming. Logging & fishing remain economic factors today. The Beachcombers TV series was filmed here on location for 19 years and was the longest running tv series in Canadian history. It first aired in October of 1972 and the series ended April 1992. One of the shows beacons, Mollys Reach can still be visited today. Stop in and enjoy a delicous meal overlooking the harbour and wharf. "NEW" Share a REVIEW of your favorite Gibsons Restaurant! In July of 2007, the main character of the series, Nick Adonis' boat was put on display in the village. Ther Persephone has now found a home just beside Molly's Reach. For a peek at Mollys and other Gibsons restaurants be sure to check out this section. Sunshine Coast accommodation can be a little tricky, but there are many great bed and breakfasts, cottages for rent, private motels, and a campground or two in Gibsons. Today Gibsons BC is a thriving town and offers a great alternative to living in the Vancouver area. It has become on option for those who work in the lower mainland to commute from the Sunshine Coast to Vancouver on a daily basis. Over 1500 people do the commute on a daily basis. The commute from Gibsons to downtown Vancover is acutally quite short, it takes me 1hour and 30 minutes from leaving my house to the down town core. Not bad in comparison to a commute from the Fraser Valley or other communities in the Vancouver area. There are Jack Bell Foundation van pools to join to carpool to various areas of the lower mainland and some independent car pools have been arranged as well. Others rely on BC transit, or cars parked in the Horseshoe Bay area. It is an option... and if you are considering a move or a home purchase, Gibsons BC should be on your options list. 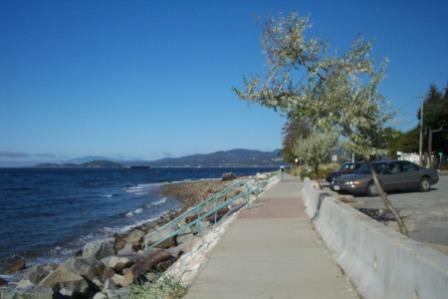 Real Estate is still very well priced in comparison to Vancouver BC, and is an excellent option for seaside living! For those who would rather be on a ferry than sitting in traffic, the Sunshine Coast is worth consideration. Studios & Galleries can be found throughout the area. There are numerous excellent artists and westcoast style is at its best. Make sure you visit some of the local galleries & studios. While out and about, check out some local shopping venues, there are some really neat stores in the area. Unique clothing & accessories can be found in some of our boutiques and stores, as well as cool local gifts and souveniers. For a complete list of stores and services available in the area, be sure to check out our Business Directory. It lists services and businesses by catagory to make it easy for you to find what you are looking for. There are kayak and canoe rentals in the Harbour, and you can even enjoy an enchanting paddle by FULL MOON by booking a Full Moon tour! They have lots of other guided day and half day tours as well. Check out the listing under the service directory for phone numbers or visit their site . Looking for "Things to Do", "Accommodations", "Businesses" in the area? Be sure to browse through the rest of our site and see what the town has to offer. Have a Question about Gibsons BC? Let's Get it Answered for you! If you have a question about Gibsons BC, ask it here! Let others answer it for you! Your story will question on a Web page exactly the way you enter it here. You can wrap a word in square brackets to make it appear bold. For example [my story] would show as my story on the Web page containing your story. What Other Visitors HaveAsked and Their Answers! Do you have horseback riding available for tourists in Gibsons BC? Question: Transport from Vancouver Airport? We have bought a house in Gibsons BC and are looking to update our kitchen.